President Bush laid down stringent terms Friday for handing out cash to the world's poor nations, saying they need to root out corruption and waste if they hope to reap benefits of a new global willingness to lend a helping hand. In a speech on the closing day of a five-day U.N. conference on poverty, Mr. Bush led calls from the world's rich that developing nations can expect more aid if they pursue sound policies and open their markets. "By insisting on reform, we do the work of compassion," Mr. Bush said at the U.N. International Conference on Financing for Development, in which 171 countries participated. The rewards for poor nations who put their economic houses in order would be great but those who dragged their feet on stamping out corruption and running their governments cleanly and efficiently would be left behind, said Mr. Bush. "We fight against poverty because hope is an answer to terrorism," Mr. Bush said. "We fight against poverty because opportunity is a fundamental right and human dignity. We fight against poverty because faith requires it and conscience demands it. And we fight against poverty with the growing conviction that major progress is within our reach." Mr. Bush said the United States is determined to challenge "the poverty and hopelessness and lack of education and failed governments that too often allow conditions that terrorists can seize and try to turn to their advantage." And he framed his intent to create a Western hemisphere-wide free trade zone in terms of improving quality of life for the poor and even spoke of the possibility of a new global free-trade pact. "When trade advances, there's no question but the fact that poverty retreats," he said. Before that speech, a breakfast meeting with French President Jacques Chirac gave Mr. Bush an opportunity to discuss the latest terrorist attacks that have somewhat overshadowed the poverty-fighting work here. The two presidents posed for photographs before a bank of international flags without taking questions, and sat down to their closed-door meeting Friday shortly after another suicide bombing in Israel. They discussed "in depth" U.S. efforts seeking a cease-fire in the Mideast and a Saudi peace plan for the region, White House spokesman Sean McCormack said without elaborating. Chirac, who later preceded Mr. Bush to the summit lectern, reminded him and their international audience of Europe's split with the Bush administration over an international treaty to fight global warming by mandating cuts in greenhouse gas emissions. The French president warned of "climate warming that threatens the conditions of life itself and for our children." "The Kyoto Protocol is the only credible means to reduce them, and I call upon all countries to ratify it," Chirac said. A car bomb blast Wednesday night that killed nine people outside the U.S. Embassy in Lima, Peru, ominously preceded Mr. Bush's scheduled arrival there Saturday morning and raised fears of a comeback by the murderous Shining Path guerrilla movement. After a suicide bombing Thursday in downtown Jerusalem, Secretary of State Colin Powell, who is traveling with the president, worked the phones aboard Air Force One trying to broker an Israeli-Palestinian cease-fire. Then on Friday, at a military checkpoint in the West Bank, a suicide bomber blew himself up, wounding two people, police said. 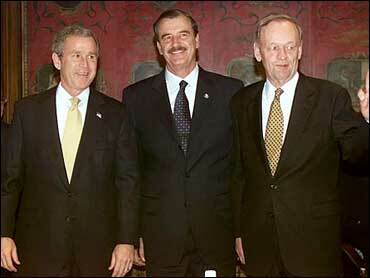 Stopping terrorists at America's own borders is a topic of Mr. Bush's talks here with Mexican President Vicente Fox and Canadian Prime Minister Jean Chretien. Powell and Mexican Foreign Minister Jorge Castaneda on Friday were signing a 22-point border agreement much like the one Homeland Security Director Tom Ridge signed with Canada in December. The pact commits the United States and Mexico jointly to developing high-technology inspection systems, finding ways to speed trade and legal visitors across the border, and sharing intelligence on criminals that both sides want to keep out. "We're sharing information the likes of which we've never shared before," Mr. Bush told Texans at an El Paso rally before his own border crossing to this modern, industrial city in northern Mexico. In one-on-one talks Friday evening with Fox, Mr. Bush was announcing a new effort by the U.S. government to encourage private business investment in developing Mexico's poorest areas — those that push the most illegal immigrants across the border into America search of a better life. Aides said new government funds will not be included in the Mexican development initiatives. The larger aid package that Mr. Bush came to Monterrey to promote is one in which the administration plans to use some $10 billion in additional foreign aid over the next three years to reward nations that are tackling corruption, bulldozing trade barriers and implementing democratic reforms.